Young longleaf pine seedlings are fire-resistant and grow long taproots to reach water, but when newly established they are more susceptible to drought. Photo by Derek Ramsey, courtesy of Wikimedia Commons. Longleaf pine ecosystems are among the most threatened in the U.S., and managers across the southeast are prioritizing longleaf restoration. The conventional approach calls for removing hardwood trees such as oak. Loudermilk recently led a study questioning this conventional wisdom. “We found that oaks can help longleaf pine seedlings survive,” says Loudermilk. “On dry sites, the presence of oak facilitates longleaf seedling survival, especially when the seedlings are less than 2 years old.” Loudermilk and her colleagues published their findings in the journal Ecosphere. The scientists analyzed long-term data on young longleaf pine seedlings at Eglin Air Force Base in Florida. The base is home to large tracts of longleaf pine that escaped the widespread and intensive logging that occurred in the early 1900s. Longleaf pine trees dominate the canopy, and the midstory and understory is mostly made up of native oak trees. The scientists studied longleaf pine seedling establishment and survival after 2 periods of prolific seed production, known as mast events. In longleaf pine, mast events occur every few years in complex and irregular cycles which are influenced by climate and other factors. 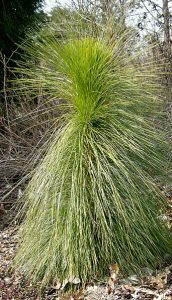 During a mast year, vast numbers of longleaf pine seeds are produced, and after a mast year, the number of seedlings skyrockets. However, many of those seedlings die. Loudermilk and her colleagues analyzed seedling establishment and survival for a 2 year period immediately after mast years that occurred in 1996 and 2011. “The number of oaks in the midstory had a significant effect on longleaf pine seedlings,” says Loudermilk. “Longleaf seedlings growing in the presence of midstory oak trees had a much higher survival rate.” The protective effect was noticeable when there were as few as 17 oaks per acre, and when there were more midstory oaks – up to 560 per acre – they did not impede longleaf seedling establishment. In order to determine how the oaks helped longleaf seedlings survive, Loudermilk and her colleagues measured moisture stress and environmental conditions. 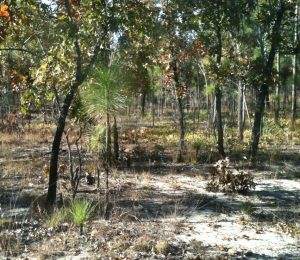 The military base is considered a dry sandhill habitat, and the scientists concluded that one of the ways oaks helped longleaf pine seedlings was by reducing moisture stress in hot and dry conditions. “It’s true that longleaf pine needs plenty of sunlight to grow,” says Loudermilk. “However, we suspect that for seedlings on dry sites, the benefit of some shade – which reduces moisture stress – outweighs the demand for sunlight.” Newly established longleaf pine seedlings are susceptible to drought, although once established, they thrive in dry habitats. 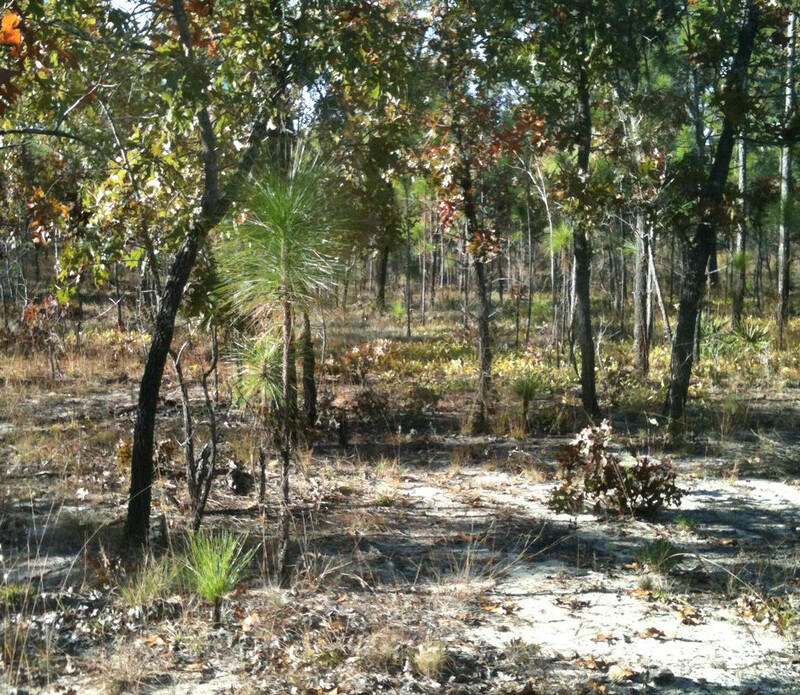 The shade that midstory oaks provide can alleviate water stress and facilitate longleaf pine seedling survival. Photo by Louise Loudermilk, USFS. “This phenomenon may explain how longleaf pine recovers in canopy openings,” says Loudermilk. Hardwoods grow quickly into the midstory in these openings, and without a mechanism such as facilitation, longleaf pines could not successfully re-establish in these areas. In essence, the oak midstory may provide the path back for longleaf pine establishment after large canopy disturbances. For more information, email Louise Loudermilk at elloudermilk@fs.fed.us.